Yay!!! It's Friday!!! I have 2 days of LESS running around to do. I might actually be able so sleep in or stamp! I live for the weekends when the kids are in school. How about you? Today I decided to play along with my 2 favorite blogs....Simon Says Stamp and A Blog Named Hero. I am not very good at combining challenges. I usually never combine them but this week it was just so easy to do that I thought "why not?" And Simon Says Stamp's Wednesday challenge is to "Create your own background"
I used the journal alphabet letters from Hero Arts. I arranged them on an acrylic block going every which way. I then inked them up in Colorbox Frost White ink (just for visibility purposes) and heat embossed them with Ranger's Silver Super Fine Detail Embossing powder. I turned the stamp a few times until it covered the paper. 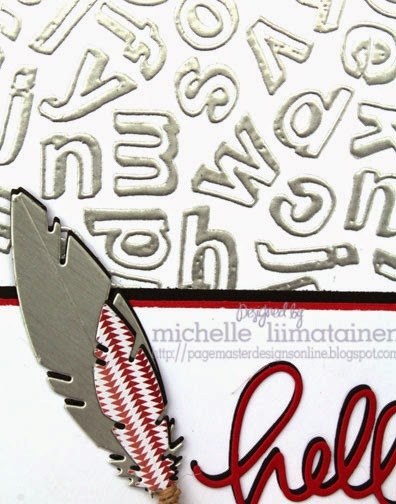 I found embossing right away works best too. The white pigment ink dries pretty fast and didn't allow me to emboss it all at once. 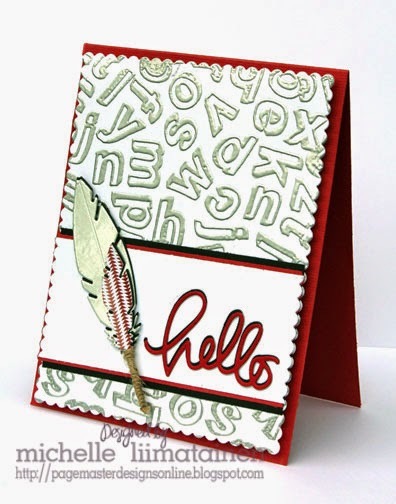 I used the Simon Says Stamp Feather die and Small Hello. I cut the large feather out of this really cool silver paper I found in my scraps and the smaller one out of some Studio Calico papers. I mounted both on black cardstock. I die cut the Hello out of Simon Says Stamp Red Lipstick cardstock and then out of black. To finish is off I wrapped some twine around the bottom of the feathers. Thanks for stopping by. I hope you have an awesome weekend. The feather is super, super cool! I love the paper you used! What a great effect - the background is awesome. Thanks joining us at Simon Says Stamp Wednesday Challenge.